Powers/Abilities: In his original form, Count Tagar possessed enhanced agility and strength. In his current form, he has superhuman endurance, and approximately class 10 strength. His senses are more refined than that of an ordinary tiger, granting him superhuman tracking and vision powers. 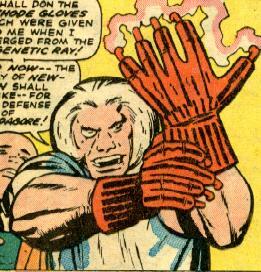 Following his creation, the High Evolutionary gave him Cathode Gloves which have claws on the tip of each finger that generate energy blasts. History: (Scarlet Spider Unlimited#1 (fb)) - Count Tagar was one of the first of the New Men created by the High Evolutionary. 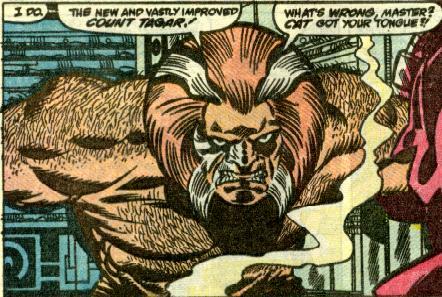 Genetically engineered from a tiger, Tagar was given the royal title of Count, and was one of the High Evolutionary's most important emissaries to the outside world. Because his features were more humanlike than most New Men, Tagar was shunned by some of the other New Men. (Thor I#134 (fb)) - Deciding that the New Men needed to be taught by someone from the world of man, the High Evolutionary assigned Count Tagar and Sir Porga to find a teacher. (Thor I#133) - Sir Porga met with nurse Jane Foster in Transia, and introduced her to Count Tagar. Tagar believed that Foster would be the perfect teacher for the New Men, and was particularly impressed that she was trained in medicine. (Thor I#134) - Count Tagar and Sir Porga brought Jane to Mount Wundagore, and fought off a group of bandits who hoped to force Tagar to bring them to the treasures of Wundagore. (Thor I#135) - After the accidental creation of the Man-Beast, Tagar joined the Knights of Wundagore and Thor in battling him. With the Man-Beast's defeat, the High Evolutionary took his base ("New Wundagore") into space, to find a new home for the New Men. (Thor I#402) - Count Tagar met with the Mongoose, who had been assigned to obtain cell samples from Thor. The Mongoose employed Quicksand to assist them to that end. (Thor I#403) - Seeing that Quicksand had brought Thor into the open, Count Tagar dispatched the Mongoose to collect the cell samples. (Thor I#405) - Count Tagar studied the cell samples, and asked the Mongoose to bring him more. To that end, the Mongoose kidnapped Thor's friend Eric Masterson. (Thor I#406) - Count Tagar was disgusted with the way the Mongoose obtained his results, particularly as it led Thor to attacking Mount Wundagore. Tagar released Masterson, and told Thor how the High Evolutionary and Hercules were lost within the Black Galaxy. Thor set off to find them both, alongside Masterson and the Knights of Wundagore. (Thor I#408) - Upon Thor's return, he shaved off the beard he had grown. Tagar had one of the New Men bring him the blood and hair from Thor's shaving bowl so that the genetic material could be used by the High Evolutionary. (Thor I#417) - Count Tagar joined the High Evolutionary aboard New Wundagore in the Black Galaxy, to begin their attempt at creating the New Immortals. (Thor I#419) - Count Tagar and the High Evolutionary were discovered by the Rigellian Recorder#211, but the High Evolutionary blasted him unconscious. (Thor I#420) - Count Tagar observed as the High Evolutionary began to create a new world within the Black Galaxy. He then accompanied him to the laboratory where Nobilus, first of the New Immortals, had been created. Tagar wondered if Nobilus would be a compassionate god, or a vengeful one. Nobilus' closed fist seemed to answer his question. (Thor I#422) - Count Tagar observed as both Zon and Juvan were created by the High Evolutionary, and saw that Nobilus was, tragically, prone to beserker fits. He finally decided to enter the Pool of Knowledge himself to unlock his godly potential, in the hope of aiding his master. Tagar emerged from the Pool of Knowledge in a new, superhuman body, with godly strength. (Thor I#423) - Tagar came to sense the arrival of the Celestials in the Black Galaxy, and sought out the High Evolutionary to warn him. (Thor I#424) - After telling the High Evolutionary that the Celestials had come to the Black Galaxy to create a new Celestial, he collapsed from exhaustion. (Thor I#425) - After awakening, Count Tagar assumed control of New Wundagore, and had the now-mad High Evolutionary brought back aboard. He also promised Thor to restore the Analyzer to his original form as Recorder#211. (Thor I#448/2) - Count Tagar welcomed Balder and Sif aboard New Wundagore as he and the New Immortals searched for the High Evolutionary and Analyzer, whose trail led them to Ego, who was being studied by the Celestials. (Thor I#450/2) - Count Tagar witnessed the safe return of the High Evolutionary, Analzyer and Nobilus to New Wundagore, thanks to Sif and Balder. (Thor I#473 (fb)) - When the High Evolutionary at last regained his sanity, he decided to create yet another new race on Earth. Count Tagar was put off by his master's abandonment, and joined the New Immortals in opposing him. The High Evolutionary abandoned New Wundagore, leaving it to the New Immortals. (Thor I#482) - Count Tagar fought the High Evolutionary, God Pack and Thor alongside the New Immortals, plotting to use Deus Ex Machina to wipe out all life on earth so that they could then create life of their own. In the course of the battle, he fought the High Evolutionary himself and was beaten into a coma. (Thor I#483) - The High Evolutionary placed Tagar into suspended animation and set him aboard Wundagore III with the other New Immortals. He hoped to one day repair the damage done to Tagar and revive him. (Thor I#484) - The High Evolutionary began his treatment of Tagar by using a bio-retardant ray, which he hoped would undo the damage caused when Tagar had entered the Pool of Knowledge. Comments: Created by Stan Lee, Jack Kirby and Vince Colletta. Tagar's current fate is not known. In the flashback seen in Scarlet Spider Unlimited#1, Tagar was created simultaneously with Sir Porga and Bova as the first 3 New Men, but according to the flashback from Amazing Spider-Man Annual#22, there were already dozens of New Men by the time of Bova's creation. The earlier account is most likely the correct (it's doubtful that the High Evolutionary would create his first 3 New Men at once as well), but I have no trouble believing that Porga and Tagar were the first two New Men.